This article in the series Clavichords in Britain appeared in BCS Newsletter 39, issued in October 2007. In the Bate Collection, Oxford, at the head of the stairs leading to the mezzanine gallery, is a group of three historic clavichords, arranged side by side. The first is Arnold Dolmetschs No. 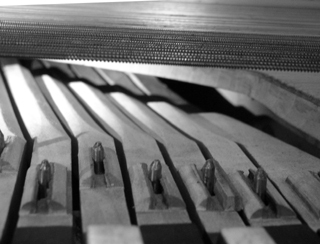 1 from 1894: the very clavichord that began the clavichord-making revival. Notice the elegant Arts-and-Crafts-inspired case of light-coloured wood with gilded mouldings. 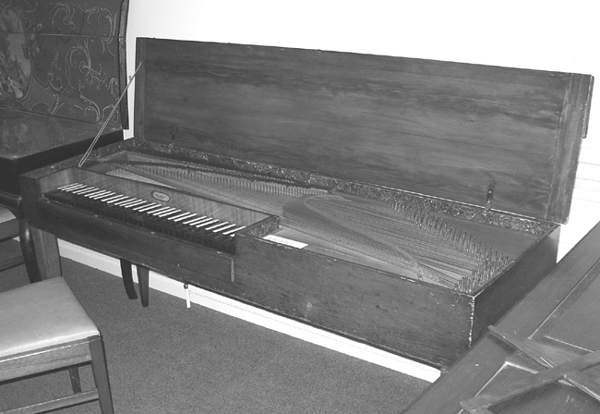 This instrument was modelled on a large five-octave Hass clavichord, very like the one which is sitting next to it: the Bate Collections splendid Hieronymus Hass, dated 1743, which is in fine playing order and which BCS members have had the opportunity to hear on several occasions. Somewhat overshadowed by the gorgeous decoration of the Hass is its other neighbour, an even larger clavichord with a plain-looking case of darkly varnished fir, a little the worse for wear in places (Fig. 1). The compass of 5½ octaves FF–c4 suggests an early nineteenth-century date: this was the period when the clavichord existed alongside, and as an alternative to, the fortepiano. The keyboard too looks modern, particularly the natural keyplates of ebony without the scribed lines which were usual in the eighteenth century – but perhaps these plates are replacements, as they do not seem to be much worn. The sharps, of stained fruitwood capped with bone, suggest a Saxon or South German origin; the absence of octave strings in the bass (unlike the neighbouring Hass) points to the same conclusion. The extension of the compass right up to c4 results in very short string lengths in the treble, particularly as the maker has apparently chosen to use brass wire. 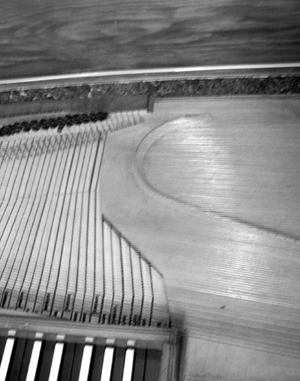 In order to reach their strings in the required positions, the top seven or eight keylevers have to pass right under the treble curve of the bridge, and to make this possible, the soundboard has been made to overhang these keylevers (Fig. 2). To support the soundboard edge, a piece of wood some 15 mm (¾ in) thick is attached to the left side of the belly rail, hollowed out (presumably) except at the actual edge so that the bridge is free to vibrate. This means there is not much room above the treble keylevers, which are cut away to provide clearance (Fig. 3). In addition, the pivot points of the top seven keys have had to be moved forward, otherwise it would be impossible to get these keys out from under the overhang. Clearly, when this instrument was made, a compass ascending to c4 (three octaves above middle C) was essential, and the maker was prepared to make radical changes to traditional clavichord design in order to achieve it. This is not the only clavichord with an overhanging soundboard. An instrument by Siegmund Theodor Krämer, for example (No. 32 in the Leipzig Museum), has the soundboard extending over the top two keylevers, and we find something similar in Swedish clavichords made after about 1750. In the Swedish instruments the left edge of the soundboard follows an elegant smooth curve, whereas on the Krämer clavichord, and on this one, it has a rather awkward, irregular shape. The keys are guided at the rear by a conventional rack, but the arrangement at the pivot points is unusual. Instead of a plain slot formed in the keylever itself by means of a broaching tool, the balance pins are guided in this instrument by two quadrant-shaped slips of wood faced with leather: an early example of a bushed pivot (visible in Fig. 3). Other points one notices: old overspun strings in the bass, possibly original; the fall-board and lid-flap hinges made of coils of brass wire round an iron staple; the marbled papers all round the rim inside, like the endpapers of old books. The instrument plays easily and sounds sonorously, and it has been used occasionally in recitals. But who is the maker? So this instrument, and the Stanhope one, are the work of Georg Nicolaus Deckert (1772–1844) – not his father, Johann Nicolaus Deckert, as suggested in the third edition of Donald H. Boalch, Makers of the Harpsichord and Clavichord 1440–1840. Both makers worked in Grossbreitenbach, which is in the heart of Saxony, some 28 miles south of Erfurt: unfortunately, not much else is known about the family or their instrument-making activities. A third Deckert clavichord survives in the Leipzig Museum of Instruments (No. 31). This has a more traditional unfretted layout, with the compass C–g3 and no overhanging soundboard. The museum attributes it to the father, Johann Nicolaus, and this is probably correct, though the signature simply reads Deckert in Breitenbach. The Bate Collection of Musical Instruments is housed in the Oxford University Faculty of Music, St Aldates, Oxford OX1 1DB. Telephone: +44 (0)1865 276139. Web-site: www.bate.ox.ac.uk. The collection is open to the public Mondays–Fridays 2pm–5pm and on Saturdays during Oxford University full terms only from 10am to 12am. Closed Christmas and Easter holidays (telephone for details). 1. See Carl Engel, Some Accounts of the Clavichord with Historical Notices in the Musical Times, 1 July 1879 and 1 September 1879; quoted in Bernard Brauchli, The Clavichord, Cambridge University Press, 1998, p. 278.